Google users in the US that type queries like [I want to die], [suicidal thoughts], [suicide methods] will see a special OneBox result that provides the phone number of the National Suicide Prevention Lifeline. "This is only the second time Google has added such guidance on troubling search terms, Dr. Roni Zeiger, chief health strategist for Google, said in an interview. A few months ago, the search engine began providing a phone number for the national poison control hotline after searches like [poison emergency]," reports the New York Times. Unfortunately, it's difficult to measure how effective Google's OneBox result is, since there's no link and you can't start the call directly from Google's search result page. well, you can dial from an iPhone or Skyep-enabled browser. Didn't worked for me, i will kill myself becouse of this... goodbye stupid world! Is it going to be rolled out for other countries as well? Nothing for Ireland so far. You can also click to dial if you are using Chrome and have the Google Voice extension installed. Hmm. It's like showing contraception ads for the search "I want to get pregnant". Dr. Zeiger, your 'OneBox result' ("For suicide prevention...) is a great initiative. Unfortunately, while it's 'factual', I believe it will be fairly ineffective because it totally ignores the 'customer'. If a person types in "I want to die", they are making a pretty clear statement of what they want. 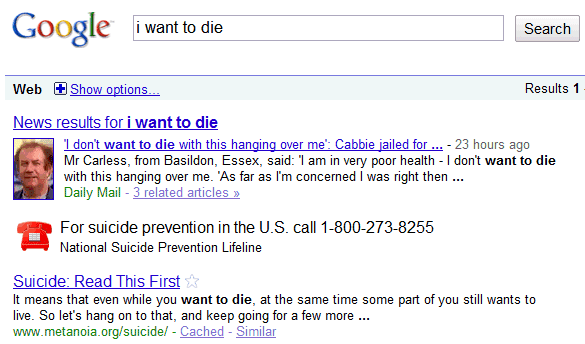 They did not ask google for "suicide prevention", so you can't give 'that' as the answer. Instead, you need to respond in a way that acknowledges where they're at & offers what they might want (someone to talk to, no judgement, help, a friend). "Life's crap. Talk to someone who understands. Free call: 123 456 7890"
"Want to talk about suicide? We listen. We care. Free call: 123 456 7890"
"There IS someone who understands what you're going through. No judgements. Just a friendly voice. Free call: 123 456 7890"
Do you have this in India too ? Many cases of suicide happen here too. India is the suicide capital of the world.